Efficient processor usage to allow for effects such as reverb, echo, envelope shaping, etc. Audio output for the Arduino is pretty well-tilled soil, but surprisingly most of the previously published options are geared towards canned sound playback, or tone generation without a focus on musicality. I’ve implemented an algorithm called Pulse Code Modulation, and I think it has a lot of potential. Keep reading for an explanation of how it works and why it’s awesome. Here we go: The method I’m using works like this. We sample our desired waveform into a char array. Here’s a graphic that should make that clear. From the Wikipedia page about PCM. 4μS is only 64 clock cycles (for 16MHz arduinos), so you can see where the choice of sample rate to match your desired frequency range is crucial. To give you a yardstick, CD quality audio (you remember them, the miniature frisbee things) uses a 41.1Khz fixed sample rate, so an 8Khz tone would have about five samples per period. Nyquist’s rule: Apparently, a dead white guy named Nyquist says that any digitally sampled waveform can be reproduced, as long as you do at least two samples per highest component frequency. I’ve never understood this result, since doing two digital samples of a sine wave will not allow you to reproduce that wave (you would have a square wave output, no?). But by that rule, doing 48 samples of our wave allows us to capture up to the 24th harmonic, which should be plenty of quality. Resolution: The other consideration here is how many steps we want between 0V output and our maximum voltage. In the graphic above, there are 16 total levels, so each sample is going to consume 4 bits of memory. I opted for 8-bit sampling, which should give me good quality, and also allows me to use the conveniently pre-defined char data type. Char is a signed 8-bit datatype, so it runs from -128 to +128. 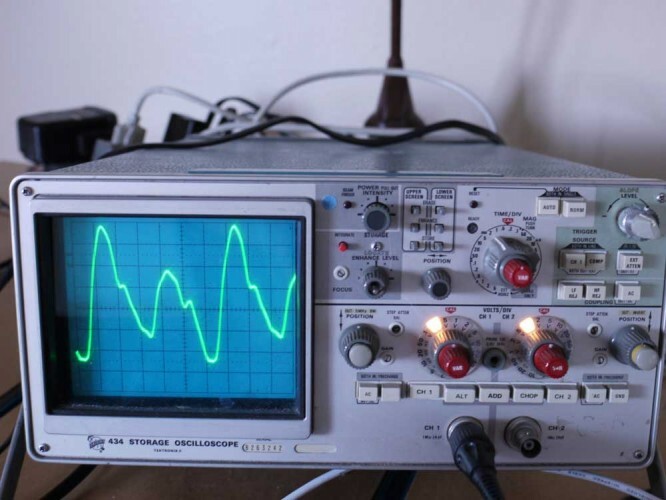 I chose this over the unsigned byte, because it will make it very easy to composite two waveforms in real time– for example to mix a square wave and a sine wave, you just add the two samples together, and divide by two. When you output, you just add 128 to your sample to get the 0-255 voltage value. Here are two sampled waves. The first is a simple sine wave, and the second is a sine wave with overtones baked in as described in my prior post. A graph of the sineovertones array. See photo at top of post. Now the clever part: Allrighty, so now we have a quasi-analog output that we can use to play back our sound. The frequency of the output wave will be determined by how quickly we step through the array. This is an ideal application for a timer Interrupt Service Routine. period = 1 / frequency = 1 / 16Mhz = 62.5nS. Atomic clocks also operate on this principle, although they use an isotope of Cesium which is much more precise (so precise, in fact, that the very definition of time and distance are based on so many oscillations of the Cesium-133 atom). These are not generally useful lengths of time, so we use a prescaler. A prescaler fixes it so that rather than incrementing that register with every clock cycle, we instead increment it every 8 cycles, or 32 cycles, or 256 cycles, etc. Using the right prescaler means that you can have a range of time measurement that suits your application, rather than having to load the processor down with counting timer overflows. Now, even with the right prescaler, 255 x the prescaler x 62.5nS is unlikely to be the exact period of time we want. The nice people at Atmel have you covered, though, because each timer has a CTC Mode (Count To Clear). This register holds a user-defined value. Every time the counter register is incremented, its value is compared to this register, and if they match, the timer is reset to 0. But that’s not all: when this match happens, a user-defined function called an Interrupt Service Routine (ISR) can be run. This is a powerful and flexible tool that can be used any time you need something to happen exactly on a specified period. Best of all, it uses no processor resources until the ISR actually runs– so your main loop() code can run happily along blinking your LED or whatever, and when the processor needs to run the ISR, it will pause it, run the ISR, and then pick up exactly where it left off. Neat. The big caveat with ISRs is that when you’re in one, nothing else can interrupt the processor, not even another ISR, until the ISR is complete. So, for example, if you set timer2 to run its ISR every .5μS, and within the ISR you do some floating point math, and turn some pins on and off, and maybe read a sensor, your program will lock up. Since you took assuredly took longer than .5μS to do all that, immediately after exiting the ISR you’ll be back in it. The main loop() code will never have a chance to run, and eventually you’ll overflow the program stack and crash. No harm done to your hardware, but if you’re using ISRs and the Arduino stops doing anything, that’s probably why. /* Normal port operation, pins disconnected from timer operation (breaking pwm). /* Disable Force Output Compare for Channels A and B, whatever that is. Since frequency control is a single value, melodies or basslines, etc. can be encoded very efficiently by storing an array of frequency values. Real-time waveform mixing is possible. For example, store a sampled sine and sawtooth array, then adding their values together at output. Or, use the same sine wave array with varying sample speeds to generate harmonics dynamically. Real-time envelope shaping can be done by multiplying the sample values by a time-varying constant. No external hardware besides the speaker needed, since the PWM spikes and harmonics are going to be higher than the frequency response of the speaker. It does sound better when run through a low-pass filter and audio amplifier, though. With the right waveform, it sounds quite decent. Here is some work-in progress code, which takes an analog input (e.g. from a potentiometer), and uses it to control frequency. byte speakerpin = 3;  //audio playback on pin 3. This can also be set to pin 11.